This is an upgraded version of our standard bushing and features a stiffer 90 durometer Poly. These bushings replace the staked factory rubber bushings with SuperPro Polyurethane Bushings that are built to last and properly engineering to increase performance. The high-end polyurethane design eliminates the parasitic spring rate caused by staked bushings and increase service life. These bushings also provide more positive front arm location during spirited driving. 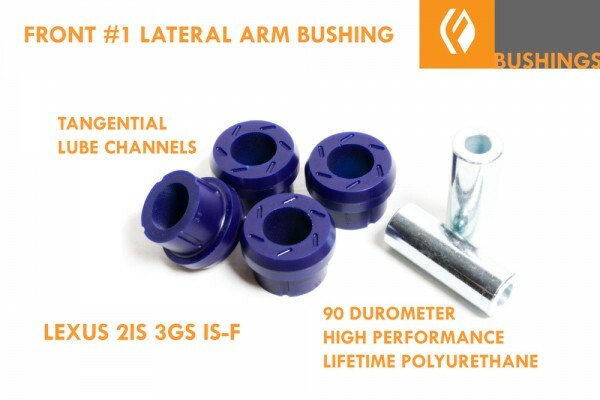 Set includes 2-Bushing pairs to replace both bushings in both arms. requires drilling out the swaged aluminum center tube on the factory bushing. A 3/4" drill bit or reamer required. 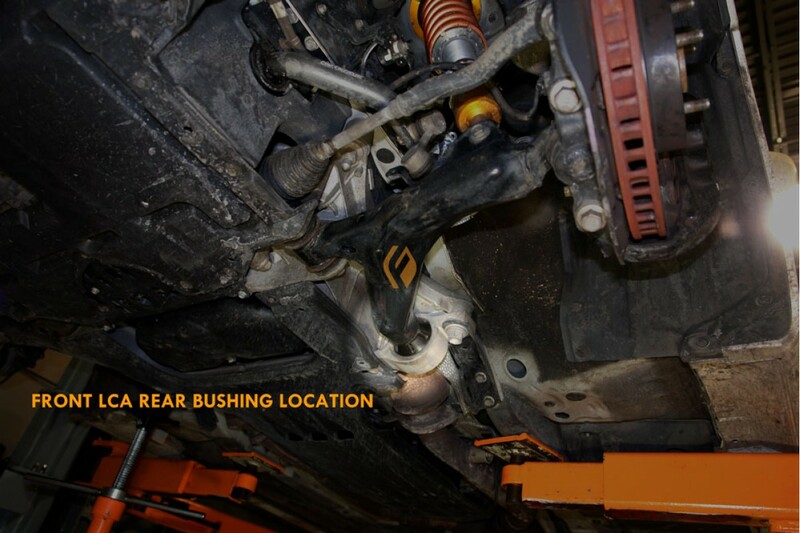 The bushing sits at the direct inboard side of the front LCA which is inward of the wheel to the front. The factory bushing is a 3 piece design with 2 caps and a center ferrule. The 2 caps are pressed into the center ferule with makes everything fairly integrated. Because of the integration, the center must be drilled out to release the 2 halves. You will need to remove both under covers to get good access to the arm bolt as well as the #2 arm bushing. Remove rear bushing bracket and the lateral arm bolt. You may need to remove the entire arm, sway bar and shock absorber to allow easier access but if supported the arm can be worked on in place. Drill out center of bushing and then hammer each end cap out of the arm with an air chisel. If still stubborn step up one size in drill bit and pass through the center again to be sure the factory bushing is separated. Install new bushings with the leading edge greased. Do not apply too much grease or it will drive the second half of the bushing out when the center tube installed. Install center tube and watch for bushing ejection. You may need to pull out one half and clear some grease if this occurs. The outer cavities in the bushing are intended to accept the excess grease, so be sure they are mostly clear relative to the volume of grease that was used. Wipe excess grease off center tube and install everything in reverse. Put a light coating of grease on the outside thrust surfaces of the bushing where the tangent grooves are. This will help lube the bushing as it is moving against the front cross member. The install is complete. Typical grease intervals are 1 year or as needed if any noise should develop. International orders are always quoted on a per order basis.